The Advantech ARM Starter Kits was released along with a built-in OS image in Linux which allows users start their evaluation immediately after they open the box. Other OS such as Android, Yocto Linux and Ubuntu are also available for different applications; each carefully verified for online download. The source codesof these supported OS are all open and available for users to help develop application code easier. In addition, Advantech offers tools for application development including Qt, a cross-platform tool for device creation, UI and application development, and Advantech WISE-PaSS/RMM APIs for device access, control and monitoring. All add-on software offerings are totally verified and 100% free of charge. Advantech is committed to offering the embedded community the best, most compact and reliable development platform for ARM-based solution development. Besides OS level support and software tools, Advantech ARM Starter Kits are released with a standard offering of service support that helps ARM users get familiar with Advantech ARM platforms and learn to operate and design applications for them. 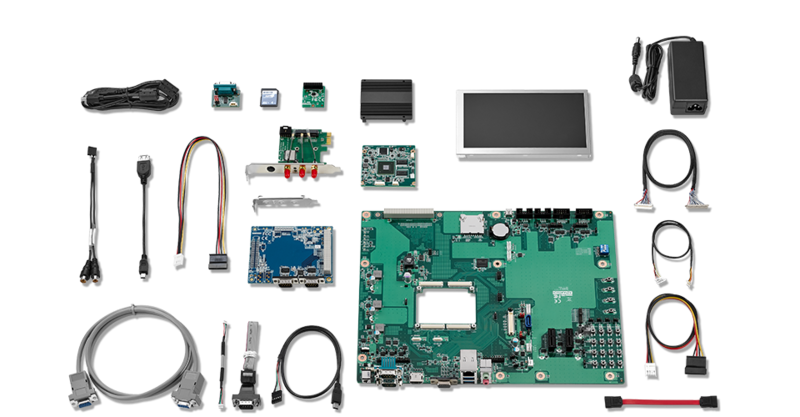 The design in service includes referenced carrier board design, layout review, schematics review, BSP user manual, starter kit user manual, OS manual, driver porting guide, trouble shooting, customization and production services provided by professional support teams located in over 20 countries around the world. Advantech ARM Starter Kits take only ten minutes to setup and are designed for performance evaluation and validation, and fast hardware design and application development. With Advantech’s ARM-based modules/boards and 7 year+ longevity support, your future ARM-based solutions should be easier to develop and reach your market faster. So get started with your ARM evaluation and in only ten minutes you can have everything you need. The Advantech RISC micro site is online for product introduction, document download and technical information sharing.